Experts at the University of Sheffield Advanced Manufacturing Research Centre (AMRC) with Boeing, has demonstrated the use of advanced 3D printing technology for the traditional knife-making industry in Sheffield. Its Design and Prototyping Group (DPG), develops everything from conceptual designs, to fully functional prototypes for a range of industries and recently joined forces with a highly respected Sheffield knife maker to design and develop a bespoke, 3D printed titanium chef's knife. Stuart Mitchell, 48, has been making knives for more than three decades, cutting his teeth in the trade as a keen ten-year-old at his father's knee. His bespoke blades are made using many of the same tools his dad used before him in the same red-brick workshop his family took on in 1980. Despite his feet being firmly rooted in tradition as a craft maker, Stuart's curiosity about additive manufacturing made him want to find out whether the advanced 3D printing technology could be combined with his top quality knife making skills to create something truly beautiful and unique. The project has allowed Stuart to compare and contrast the end product with his own handcrafted knives. Andy Bell, design strategy manager for the DPG, said: "This is design-led disruption in the truest sense of the word; a craft maker applying advanced manufacturing technologies and exploring how this could change their business model now and in the future." 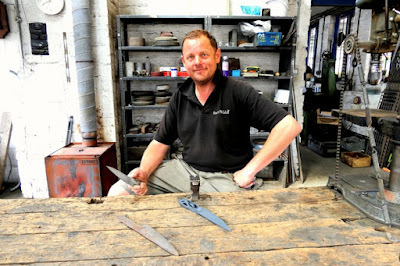 Stuart - whose knives are used across the world in Michelin star restaurants and by members of the Royal family - took receipt of the AM knife at his workshop in Portland Works at the end of summer. He was struck by the quality of the piece. "I was impressed by the profile of the blade – it replicated very well what I would do by hand, particularly the taper from the spine to the edge," said Stuart. "It did need a degree of grinding to apply an actual cutting edge but the tolerances of the edge were good to start with, very fine. I didn't realise it would print that fine. "I love the AM knife, it's different and hasn't been done before. Working in that very traditional way and to have something brand spanking new in the workshop is great - what's not to like? What it perhaps also shows, particularly with all the advances in AM, is that there is still a place for what I do as well - an ideal product would perhaps marry the two." Stuart accessed the expertise and state-of-the-art capabilities at the AMRC and benefitted from a grant-funding scheme run by the AMRC specifically to help small to medium enterprises fund research projects, under the Catapult SME assistance scheme.